Pioneers in the industry, we offer fk iron usa - al 13 - proton, fk iron usa- al 13 - galaxie ii, micky sharpz usa -000b bronze telephone dial, micky sharpz 000xb bronze micro dial liner, micky sharpz usa 000x iron micro dial liner and micky sharpz iron t dial color shader from India. AL 13 Proton: Newest addition to the AL 13 Line. The Proton is another great weapon. Suitable as Conventional Liner or Shader, this machine can take it all. The frame Geometry is based on the AL 13 Galaxie II but with another unique design. it weights 4.5 Oz. and it's a very light everyday runner that will push all types of needle configurations. Featuring "FK's 1.5 Coil System"
Smooth design that allows quick release without the need of hand pressure. Built to last: Made in USA , One piece frames made out of a solid block 7075-T6 Aircraft aluminum. Unlike most aluminum machines crafted from soft aluminum, our 7075-T6 Aluminum is almost considered a precious metal due to its hardness (hard as steel) and super light weight. Frames reinforced with radial connections in crucial angles. And yes this is in red on purpose! Perfect contact point: All machines have been designed to offer a perfect flat contact between contact screw and spring regardless configuration. Hardware: All machines are assembled by hand with FK Irons' own hardware and components. "Zap Bar" (color) or “Soft Bar" (liner-soft shader) Armature Bars: All models featuring FK's own Armature Bar designs to get the best out of every single swing. Adjustable coil deck: Set your coils up and down. A fourth dimension to machine tuning. Inlaid steel yoke for sleek sharper look. An extra crafting operation that is worth the effort. This machine is the lightest full frame machine in the world. Weighing around 4.5oz, this machine is the perfect everyday shader/ liner for anyone trying to speedup work, extensive sessions, getting rid of uncomfortable cramps and improvement of wrist/ hand overall. FK Irons (Fallen King Irons) AL13 machines feature 7075 T6 Aircraft aluminum, the hardest grade available in the market, super light and indestructible. At only 4.5oz the AL13 line offers various models that are being used by renowned artist from all over the world. Plenty of setup to choose from our machines comes pre-broken in meaning that we warranty that they will perform right out the box. 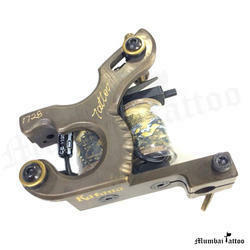 Today, FK Irons goal is provide professional tattoo artists with the best tool available making sure that their investment will always be protected with a lifetime warranty. Micky Sharpz USA - #000b Bronze Telephone Dial Based on the Micky Sharpz classic, this smooth running color-shader machine features a polished bronze frame. 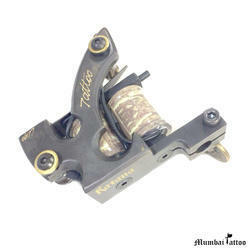 Hand-crafted in England.Our famous T Dial Tattoo Machine with added shine! For colour or shading. Constructed from Phosphor Bronze, handfiled and highly polished. All individually numbered and registered to the original owner and comes with a Micky Sharpz certificate of authenticity. Another Micky Sharpz classic. The ultimate liner, small telephone dial type frame. Cut back for positive outlining. This machine runs like a dream. One of the most popular tatt machines in the world. Hand crafted in England. Oil-blued cast frame. Each machine is individually numbered and comes with a Certificate of Authenticity. This is the Micky Sharpz classic. 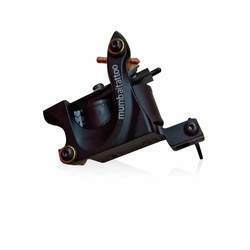 The ultimate colour-shader tattoo iron constructed from superior cast iron, handfiled and finished in oil black. Featuring - powerful high resolution H/D coils and a split collet quick change device. All individually numbered and registered to the original owner and comes with a Micky Sharpz certificate of authenticity. Beware of imitations! Designed to include the main features of the world's finest machines. Very robust and smooth running. Nicely balanced and powerful, ideal for shading and colouring. Featuring - high quality precision lost wax casting, ensuring perfect alignment of components. Comes with Sharpz high resolution magnetic coils and split collet for fast tube changing. Designed to be nicely blanced and powerful. Ideal for shading, coloring or lining. A great all around machine. Sharpz high resolution magnet coils. Frame is cast and polished brass, making this a smooth running machine. Designed around the main features of the world's finest machines, very robust and smooth running. Nicely balanced and powerful, ideal for shading, colouring or lining. Featuring - high quality precision lost wax casting, ensuring perfect alignment of components. Comes with Sharpz high resolution magnetic coils and split collet for fast tube changing. Specially designed for outlining - formed from cast iron and enhanced with brass fittings and clear coil covers. 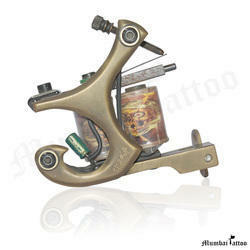 This tattoo machine is used in various forms by many tattoo artists. Featuring - fast action cut back design for smooth positive lines. Slotted front contact hole for maximum adjustment, maxi-grip quick change device for easy tube change. Powerfully smooth high resolution coils. 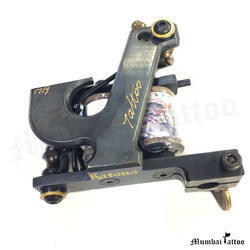 Introducing the Laconia Tattoo Machine from Eikon - A fresh look at an old idea. On close inspection you'll notice that the Eikon Laconia Tattoo machines are different. You'll see that the coils don't mount parallel to the spring mount, the base plate they mount to is actually angled downward away from the spring mount. Next, the armature bar is installed with no bend on the back spring, but the bar still clears the back coil on its down swing. Finally, the armature bars trajectory begins almost parallel to the spring mount, then travels down and away to connect with the front coil core. These differences are intentional. The subtle geometry modifications allow for the Laconia to be tuned easily with out having to bend the back spring. All Laconia tattoo machines are manufactured and assembled in Canada using quality Eikon machine parts including: Crown Standard 8 wrap Coils, Conventional Armature Bars, Conventional Springs, Binding Posts, Capacitors and RCA Connection. The cast 1025 steel frame is blackened to protect against corrosion. They feature brass binding posts and uses 11/4" Crown Standard coils. The cast silicone bronze frame is left naked so it will age with time. It features blackened steel binding posts and uses 1" Crown Standard coils installed on a 1/4" yoke. We've tuned the Laconia tattoo machines to operate on a wide range of voltages in order to accommodate for a variety of skin types, tattooing styles and needle configurations. Coloring machines operate around 105 CPS and 45% duty using a heavy weight conventional armature bar unloaded. Shading machine operate around 130 CPS and 45% duty using a medium weight conventional armature bar unloaded. Note: Speed and Duty Cycle readings stated are approximate and are provided as a guide for selecting the correct machine for the job. Split tube vise with Eikon Sphere thumb screw. Green Monster Tattoo Machine Kits are based on the Green Monster project machine featured in Machinegun Magazine. Over a five-year period, the machine parts and systems were tested and analyzed to determine the simplest way to achieve maximum control over machine function. The end result is a machine that is straightforward in all aspects of design. Three different Green Monster Machine kits are available: Liner, Shader or Coloring. The Liner kits come with a light-weight Tru-Spring armature bar and a 22uF pre-wired capacitor. Green Monster welded steel frame featuring a precision machined, two-piece, quick-change tube vise and painted industrial tractor green. 8 wrap Eikon Crown Standard coils. 3 front springs and 3 back springs in various thicknesses so you can adjust the machines exact speed and stroke length to suit how you tattoo. Kits include all the parts, tools and illustrated instructions necessary. 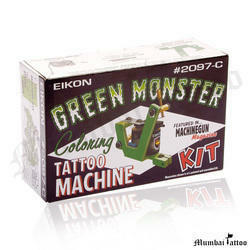 Eikon Green Monster Tattoo Machines are based on the project machine that was featured in the first five issues of Machinegun Magazine. All Green Monster Tattoo Machines are built on a welded steel side plate frame, with a precision machined, two-piece quick-change tube vise. Four different tuning options are available; a short stroke liner, a long stroke liner, a shader, and a coloring machine. The Liner machines both have light-weight armature bars. The air gap on the Short Stroke Liner Machine is 3/64"; (dime), resulting in a speed of approximately 140 CPS (cycles per second). Pre-Soldered Capacitors for easy replacement. All speeds listed are with a tube and needle installed. 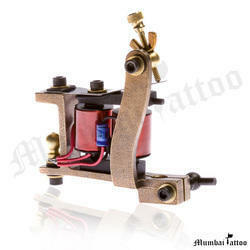 Mumbai tattoo now lunched The fine design of great tattoo machine constructed by our talented Disigners for the professional tattoo artists. The well balanced machine . Machines are amazingly stable with low noise, perfect for both professional tattoo artists and beginners. Elegant design, versatile in adjustments, raw brass frame. Liner fitted with very high resolution 10 RAP coils, where as Shader with 12 RAP. 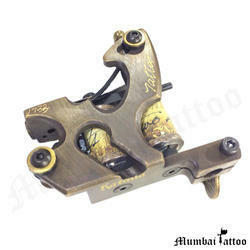 Mumbaitattoo now lunched the fine Design of great tattoo machine constructed by our talented Desing for the Professional Tattoo Artists.The well balance machine. Special Predator Carbon Steel Frame , Stable as Rock Liner & shader machines are fitted with 8-10 RAP copper threaded Coils for Fast Running Machines, Where As Shaders come with 12 RAP copper threaded coils, Fitting in the machines like top screw are silver coated , for best conductivity, are of top quality. The best yet reasonably low prices an artist can ask for. Deutschland Tattoo Coil Machine Italy Shader/Liner. This Machine is a special Limited Edition machine, Designed for perfection. Special designed frame made out of Snob Carbon Steel, Stable as Rock. Liner machines are fitted with very high resolution 8-10 RAP copper threaded Coils for fast running machines. Shaders come with 12 RAP copper threaded coils. This machine is Made in Italy. 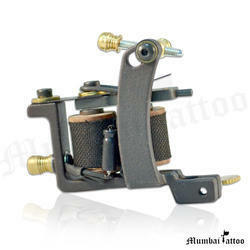 Available in Liner and Shader Tattoo Machine. 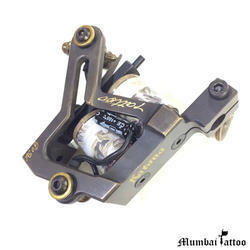 Mumbai tattoo now lunched The fine design of great tattoo machine constructed by our talented disigners for the professional tattoo artists. The well balanced machine . 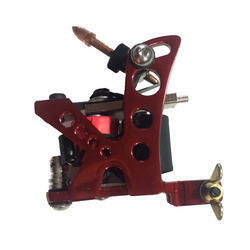 Deutschland Tattoo Coil Machine Best New Shader/Liner Tattoo Machine Designed in Germany Made in, Special Vulture Carbon Steel Frame , Liner machines are fitted with 10 RAP copper threaded Coils for Fast Running Machines . Made in, Special Vulture Carbon Steel Frame , Liner machines are fitted with 10 RAP copper threaded Coils for Fast Running Machines, Where As Shaders come with 12 RAP copper threaded coils. Fitting in the machines like top screw are silver coated , for best conductivity, are of top quality. The best yet reasonably low prices an artist can ask for. The Machine comes with Needle Retainer , Now you are free from the rubber band on the machine, the Small Wheel in front of machine helps in the free movement of the needle without consuming the power of the machine. Running at low voltage means less vibration and more stable hand for your straight lines. Simply the best in class. Coil Machines are fitted with 8-10 RAP copper threaded coils for fast running machines, where as shaders come with 10-12 RAP copper threaded coils, Fitting in the machines like top screw are silver coated for best conductivity, are of top quality. The best yet reasonably low prices an artist can ask for. Apply the latest imported 10 rings of solenoid valve technology,the magnetism of backseat is powerful.Tattoo Supply is proud to introduce the hand built Prime Coil Tattoo Machines into their line of Prime high-end tattoo products. These came about for those who would like to get the absolute best in performance, quality, and value. Each machine is precisely hand tuned and built to perform its specific task; whether it’s for lining or shading work. The Prime Coil is proudly hand-tuned in the USA with the utmost care. Katana PD 20MUMBAI TATTOO SUPPLY,Liner machines are fitted with 8-10 RAP copper threaded coils for fast running machines,where as shaders come with 10-12 RAP copper threaded coils,Fitting in the machines like top screw are silver coated for best conductivity, are of top quality. The best yet reasonably low prices an artist can ask for. Each machine is individually numbered & comes with a certificate of authenticity & 2 years of warranty on coils. The best yet reasonably low prices an artist can ask for. Each machine is individually numbered & comes with a certificate of authenticity & 2 years of warranty on coils. 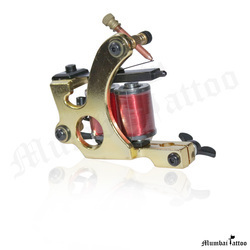 Katana Atm 006 MUMBAI TATTOO SUPPLY,Liner machines are fitted with 8-10 RAP copper threaded coils for fast running machines, where as shaders come with 10-12 RAP copper threaded coils, Fitting in the machines like top screw are silver coated for best conductivity, are of top quality. The best yet reasonably low prices an artist can ask for. Each machine is individually numbered & comes with a certificate of authenticity & 2 years of warranty on coils. BASIC COIL MACHINE 03Top selling Coil Machine Tattoo Needles is a great quality product - buy now & save big! Find more similar products like the Coil Machine Tattoo Needles here at . This guide teaches you how to set up your gun, make sure the ink. ... The electricity flowing through the wire around the coils pulls the particles. Coil Winding Machine.Technical details: more.Our company leads in manufacturing the Coil Winding Machine which can simultaneously wind 16pcs.... MTK-3021Features of Coil Winding Machine- Include standard wire clamp and micro adjust. coil winding machine. coil winding machine is a standard quality with smart machine. Top selling Coil Machine Tattoo Needles is a great quality product - buy now & save big! 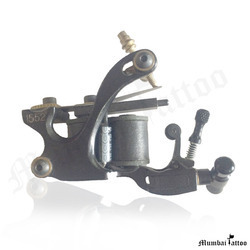 Find more similar products like the Coil Machine Tattoo Needles here at . This guide teaches you how to set up your gun, make sure the ink. ... The electricity flowing through the wire around the coils pulls the particles. 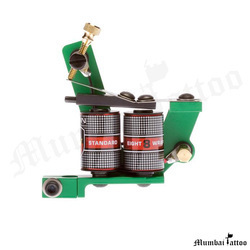 Premier Tattoo Supplies offer Tattoo Inks, Tattoo Machines and Tattoo Equipment of the ... basic coil machine tattoo machines designed to suit any requirements. Flying Machines that makes your profession fly higher..!! Specially AL-Tin Light Weight Metal for Vibration Free Tattooing experience Liner machines are fitted with 8-10 RAP copper threaded Coils for Fast Running Machines, Where As Shaders come with 10-12 RAP copper threaded coils, Fitting in the machines like top screw are brass coated , for best conductivity, are of top quality. The best yet reasonably low prices an artist can ask for. Coils: adopts the 10 wrap coils technology. Craft: the frame is cut and processed by precision line, compact size. Material: made from pig iron, with excellent electrical and magnetic conductivity. Advantages: high accuracy, stable working speed and high strength that allows it to work for 4 hours at a stretch without any heat. 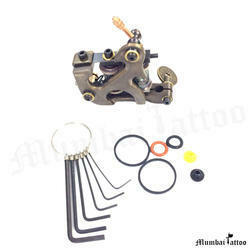 Package Content: 1 x Tattoo Machine Gun Available at Mumbai tattoo Mumbai Tattoo Supply Brings You The Best Quality Products. 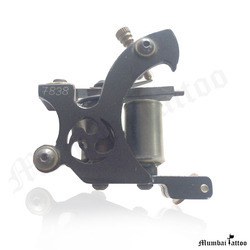 Tattoo Coil MachineTattoo Supply is proud to introduce the hand built Prime Coil Tattoo Machines into their line of Prime high-end tattoo products. These came about for those who would like to get the absolute best in performance, quality, and value. Each machine is precisely hand tuned and built to perform its specific task; whether it’s for lining or shading work. The Prime Coil is proudly hand-tuned in the USA with the utmost care. 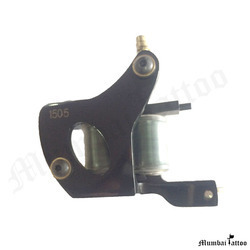 New and high-quality Tattoo machine Made of superior composite material, the spring is high-elastic and anti-fatigue for long-time working Pure iron armature bar has excellent magnetic conductivity Tattoo Machine with 10 Rap Coil You are buying a High Quality Low Noise Tattoo Machine Gun. It's designed into relief kind of pattern. The coils are 10 Rap providing higher level power. Do you want to be cool with a colorful and unique tattoo? Do you want to use a tattoo to cover a scar from burning, surgical procedures or other incidents that may feel like a blemish on your body? 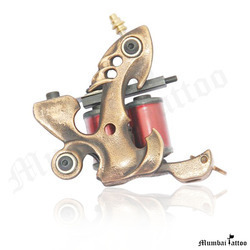 Today we are excited to recommend this tattoo machine to you. It has a steady performance after continuous working. Made of superior material and fine workmanship, it is safe and convenient to use. This small and lightweight device will give you a lot of convenience. This device won't let you down! 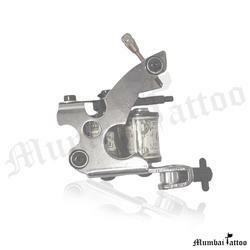 BASIC SILVER COIL MACHINE Mumbai tattoo now lunched The fine design of great tattoo machine constructed by our talented disigners for the professional tattoo artists. The well balanced machine. Looking for Katana Machine ?